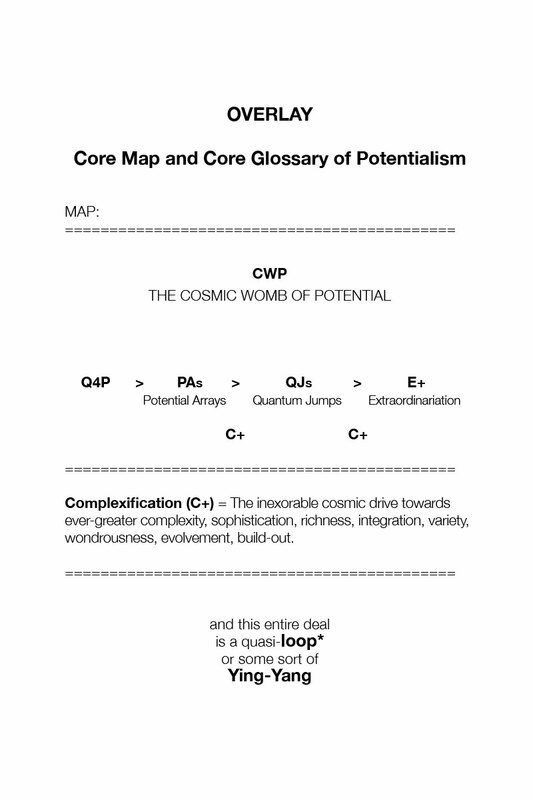 CWP Cosmic Womb of Potential. This is the metaphysical realm within which Potential, QJs, PAs, and E+ all convene to shape the nature and events of the universe. It is easiest to conceptualize the Cosmic Womb as a metaphysical place of creation. It is, in and of itself, not a thing, but a metaphysical space/place for the birth of things. As such, it can bring forth to life the concept of the physical as well as the philosophical. The physical universe is the non-abstract part of the CWP. The CWP is often looked at as analogous to the sciences. 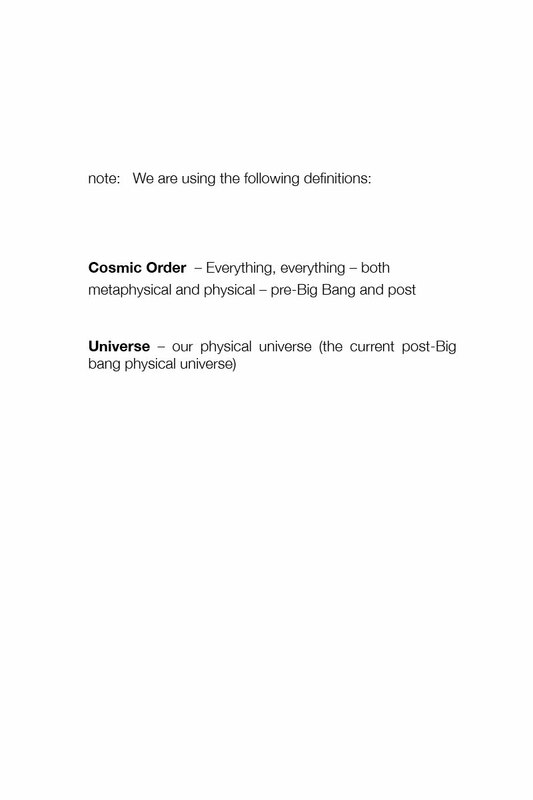 There is the physical sciences and the classical sciences, the latter being the purely mathematical, abstract and philosophical (see ParadigmChallenge.com). 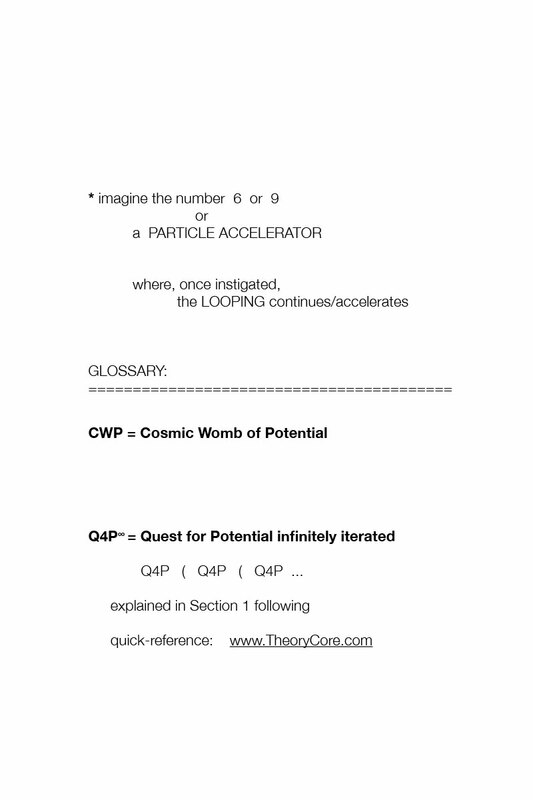 Q4P∞ The Infinite Quest for Infinite Potential, usually shortened to Quest for Potential in conversation, though the formal name best represents the iterative, infinite nature of Potential. This represents the universe’s innate drive towards fulfilling its true potential. Also commonly denoted as Q4P∞ or, super-shorthand: Q4P. 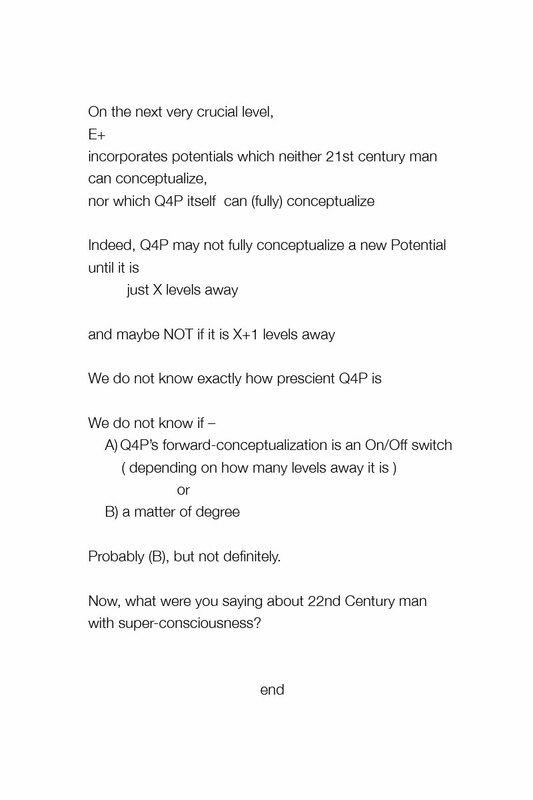 Q4P∞ → E+ The fundamental, basic drive of the cosmic dynamic. This represents the Quest for Infinite Potential which drives the cosmic order towards greater and greater complexity towards its own Extraordinariation and is the core of Potentialism (see Sequence1000.com). As the universe inherently is driven towards greater and greater complexity, it thus pushes it towards the inevitable goal of Extraordinariation – or a state of super/infinite Complexification. “0”-Point The Zero Point represents the universal pre-Big Bang. In physics terms, it is the pre-known universe, when all Planck values were under 1. It was a “time”, if such can be said to exist before time existed, when space was near infinitesimally small, and gravity, light and much of the rules of current physics did not exist yet. 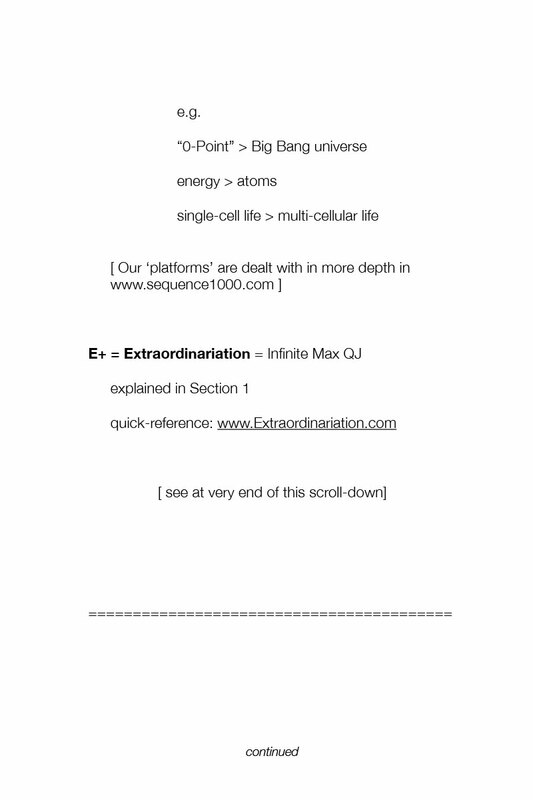 The 0-Point was what existed before the Q4P of the universe caused the Big Bang and the first fundamental QJ, which began forming our current universe. 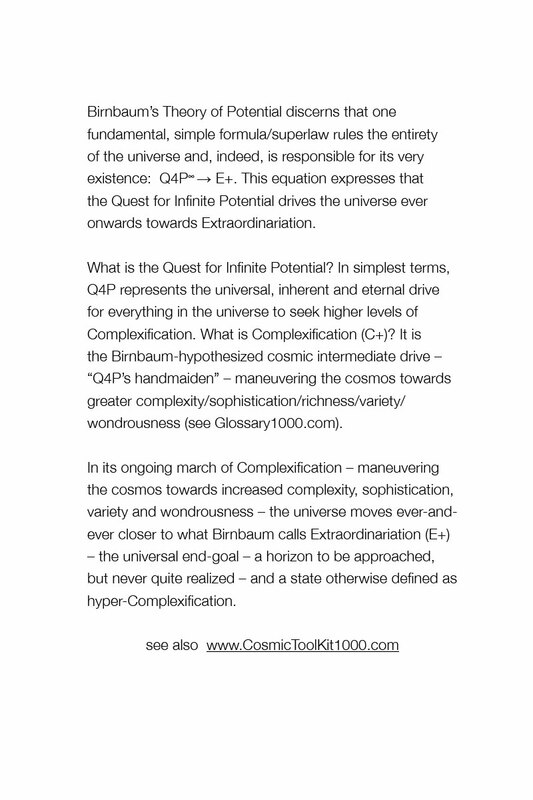 C+ Complexification The hypothesized cosmic intermediate drive – “Q4P’s handmaiden” – maneuvering the cosmos towards greater complexity/sophistication/richness/integration/variety/wondrousness. 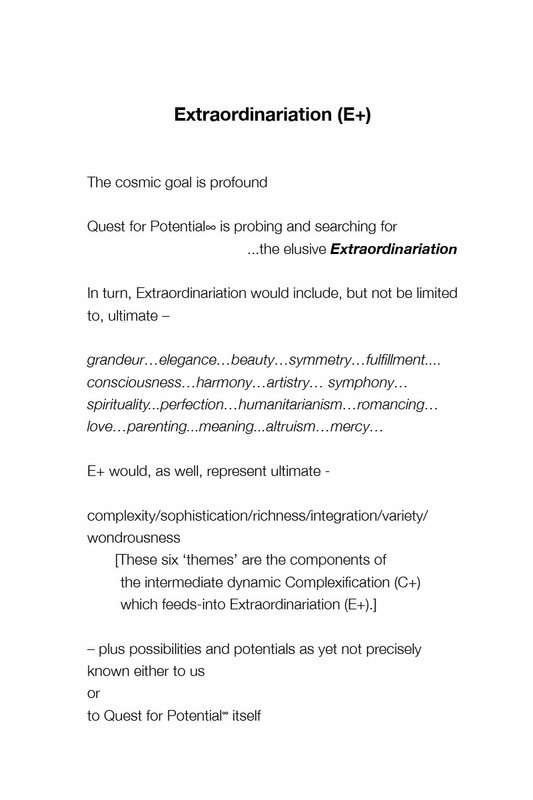 In turn, note that one of the components of Complexification just-noted above is ‘integration’; meaning, Complexification does not occur divorced from the cosmic landscape; rather, Complexification integrates into-the-process the harmonization/optimization of the ongoing Complexification with the existing bio-landscape. 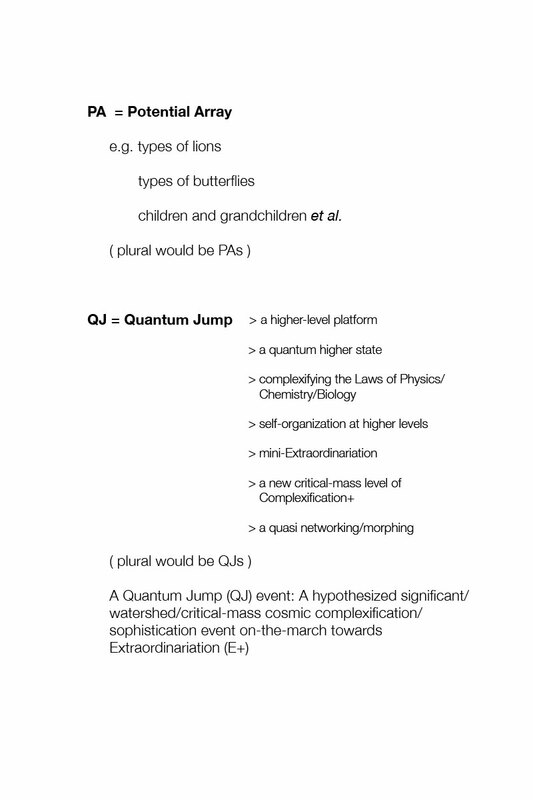 Complexification seeks quantum jumps – QJs (see entry in this same Glossary) – as opposed to incremental advance. 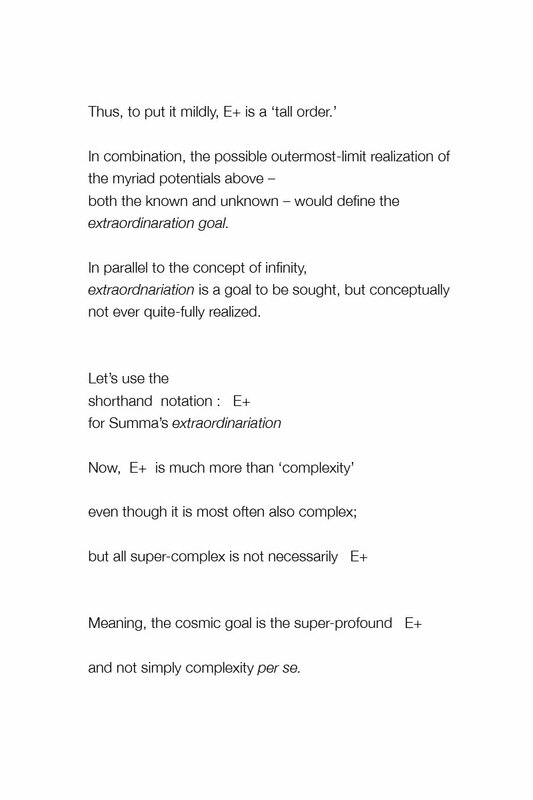 In its ongoing march of Complexification – the universe moves ever-and-ever closer to what Birnbaum calls Extraordinariation (E+) – the universal end-goal – a horizon to be approached, but never quite realized – and a state otherwise defined as hyper-Complexification. QJ A Quantum Jump. This is an episodic, cyclical cosmic occurrence when the fundamental degree of Complexity in the universe reaches a certain critical mass, a certain higher level, e.g. birth of the atom, birth of the molecule or the birth of sentience/thought. A QJ represents when the continual build-up towards Extraordinariation leaves a tangible foot print in the physical universe represented in a mini-Extraordinariation event. This is signified by an observable quantum jump in the level of Complexity existing in the universe. PA Potential Arrays. These are common events of expression of something’s potential, such as the birth of a child; a chemical chain reaction; the birth of a star. A PA represents a clear (incremental) increase in expression of Potentiality while not representing a quantum jump in Complexity (which would be a QJ event). 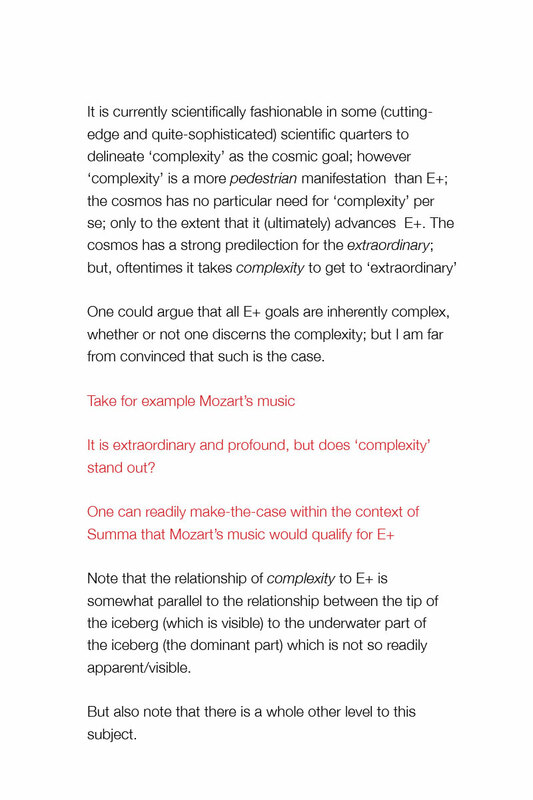 To clarify further, it is can also encompass an object increasing in Complexity, but not beyond what is currently considered a standard of universal complexity. More simply put, the birth of the first star was a QJ event, but the birth of subsequent stars are simply PA events. E+ Extraordinariation. The other side of the Q4P∞ equation, Extraordinariation represents the building complexity of the universe. It is also sometimes referred to as super-Complexity. As noted, Extraordinariation is a goal, as opposed to a concrete denouement. E+ is not a state which will actually be present in the universe. As alluded-to, mini-Extraordinariation events which appear episodically in the universe are labeled QJ – or Quantum Jumps (see shortly below). Summa Metaphysica is a paradigm-changing work; it entirely changes the way we look at everything.